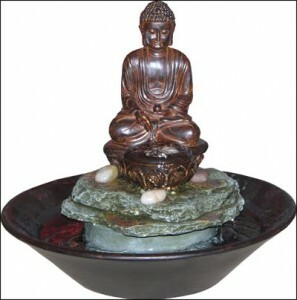 Eastern tabletop fountains all have one thing in common – serenity. Whether you choose an Eastern tabletop fountain that has additional lighting features or focuses on the gentle flow of water across river rock you will have chosen a distinctive piece which can enhance your calm throughout the day. Our Eastern table top fountain selection has been designed to complement multiple home and business décor styles. You will find sleek lines, black and grey tones, natural river rock, and accents such as slate discs, metal tones and multiple options for illumination and lighting in our collection. To help you choose the perfect Eastern tabletop fountain we have provided size, specifications and warranty information for each our table top fountains as well as pictures which show the beauty of the artistic construction of these fountains. Several of our Eastern tabletop fountains also include video to help you experience the sights and sounds of our table top fountains in motion with gentle water movement. If you find peace gazing at the moon, sitting in meditation, or mindful practices an Eastern tabletop fountain will help you to focus your energy on positive moments of meditation throughout the day. All of our fountains are designed with space saving features in mind and can be prominently displayed on desk or table tops, or tucked into sacred spaces, nooks, and crannies throughout your home and office to help remind you to stop, look and listen even in the most stressful events of daily living.